One of the best spots on the development! A family home which is perfectly positioned on what can only be described as one of the best locations on the Saighton development, benefitting from an open aspect to the front. Offering an attractively designed frontage, with a well laid-out interior that is both practical and spacious, this property will appeal to all. The property is situated in the ever-popular development of Crown Park, Saighton, which has great and easy access into Chester city centre along with the nearby road networks to places further afield. The property enjoys a true walk in finish where immaculate presentation and easy maintenance sit central to all that’s on offer. Starting off in the hallway, there is a turned staircase rising to the first floor and a large window to the side which floods the hall with a fantastic amount of natural light, doors open off into the reception rooms and wc. The lounge is found to the front of the home and benefits from the space needed for practical living. The kitchen/diner is beautifully finished with modern base and wall units, having all the integral appliances you could need, along with ample space for a dining table and French doors leading out to the rear garden. 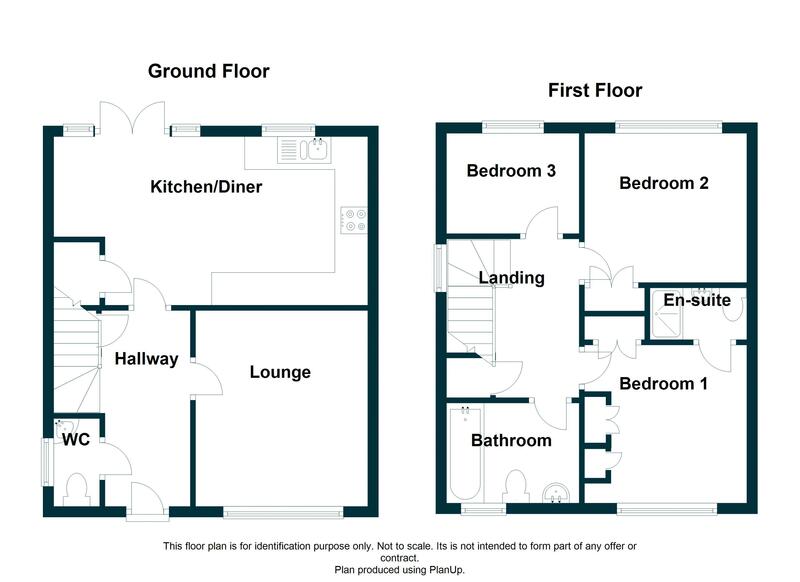 To the first floor the master bedroom comes complete with both built in wardrobes and the luxury of an en suite shower room, fitted with a double shower cubicle. The two remaining bedrooms are both generous in size, whilst the bathroom is beautifully finished with attractive tiling and a white three-piece suite. The outside of the property benefits from a driveway to the side which in turn leads to the detached single garage. The rear garden is mainly laid to lawn with a newly fitted patio seating area. This is a home you can walk in and know you don’t need to lift a finger! Saighton is in a wonderful situation offering the best of both worlds, being on the edge of open countryside whilst being within easy striking distance of Chester city centre and the A55 southerly by pass. There are a wide range of facilities in nearby Huntington and Boughton including a Sainsbury's supermarket, with the River Dee and Red House public house/restaurant also within easy striking distance. The property is also a short walk from the Rake & Pikel public house. Composite entrance door with frosted glass inserts. Staircase rises to the first floor with built in storage cupboard beneath. Wood effect laminate flooring. Radiator. Power points. Two ceiling light points. Internal doors lead into the open plan kitchen/diner, lounge and downstairs WC. Fitted with a dual flush WC. Corner wall mounted washbasin with mixer tap and tiled splashback. Radiator. Extractor fan. Recessed spotlights. Frosted PVC window to the side elevation. PVC window to the front elevation with open views over a communal green. Radiator. TV aerial, telephone and power points. Ceiling light point. The kitchen is fitted with a comprehensive arrangement of wall and base units, incorporating drawers and cupboards. The work-surface houses an inset sink with drainer and mixer tap. Integral appliances include a double oven, four ring gas hob with extractor hood over and integral larder style fridge-freezer. Wood effect laminate flooring which flows through from the hall. Power points. Recessed spotlights. PVC window to the rear elevation. PVC French doors with adjoining side windows open out onto the rear garden. Built-in cupboard with space and plumbing for washing machine and dryer. Wood effect laminate flooring. Radiator. Power points. Recessed spotlights. PVC window to the side elevation. Built-in over-stairs storage cupboard which houses the Megaflow water system. Hatch providing access to loft space. Radiator. Power points. Ceiling light point. Internal doors lead into the three bedrooms and bathroom. PVC window to the front elevation with open views over a communal green. Fitted wardrobes provide hanging and shelving facilities. Radiator. TV aerial and power points. Ceiling light point. Internal door opens into the en suite. Fitted with a three-piece suite to include a fully tiled double-width shower enclosure with sliding glass doors. Wall mounted washbasin with mixer tap. Dual flush WC. Wood effect laminate flooring. Electric shaver point. Extractor fan. Heated towel rail. Recessed spotlights. PVC window to the rear elevation. Built in wardrobe provides hanging and shelving facilities. Radiator. Power points. Ceiling light point. PVC window to the rear elevation. Radiator. Power points. Ceiling light point. The bathroom is fitted with a white three-piece suite to include a panelled bath with mixer tap, shower over and glass shower screen. Dual flush WC. Wall mounted washbasin with mixer tap. Part tiled walls. Wood effect laminate flooring. Extractor fan. Heated towel rail. Recessed spotlights. Feature diamond shaped PVC window to the front elevation. The property enjoys a fabulous open aspect to the front, overlooking a communal green, with a shared driveway continuing to the side elevation, providing off-road parking for two vehicles and leading to the single garage. The lawned frontage has a pathway leading to the front door. The landscaped rear garden is laid mainly to lawn with a paved patio seating area, accessed via the French doors in the kitchen/diner. A paved pathway leads to a further raised patio seating area to the rear of the garden with gravelled borders. The garden is fully enclosed by panelled fencing. Proceed out of Chester through Boughton and at Bill Smiths Motorbike Garage take the right back in the direction of the City Centre and take the first left onto Sandy Lane. Continue along Sandy Lane for some distance, until it merges into Chester Road. At the roundabout take the first exit signposted Saighton and then turn immediately left into the Crown Park development. Follow Highlander Road along until the first mini roundabout proceeding straiight over and then take the next straight over again onto Alanbrooke Road. Take a left onto Wellesley Crescent and then left and left again onto Dale close where the property will be seen on the left hand side overlooking the green. View or download the Energy Performance Certificate for Dale Close, Saighton, Chester.